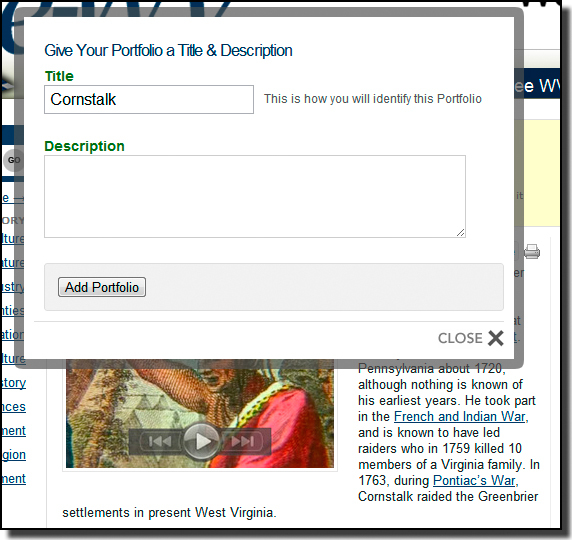 One of the most powerful tools in e-WV is the portfolio. It serves as a place to organize materials for research and for presentation. There is no limit to the number of portfolios you can create and save in e-WV. It all starts by first creating an account. After you have an account, just sign in at the upper right of any page. You will immediately be taken to your new My WV tab. 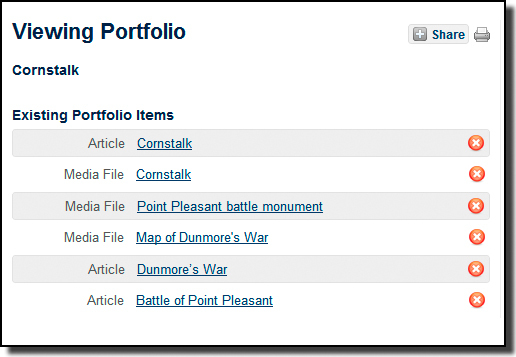 Note there are two places where you can view your portfolios. Don’t have any? Let’s create one. After you click the link, you see the option to add this item to either an existing portfolio, or to create a new one. After you click New, you see a dialog box asking for the name of your portfolio. You can also add any descriptive notes you like, but this is not required. 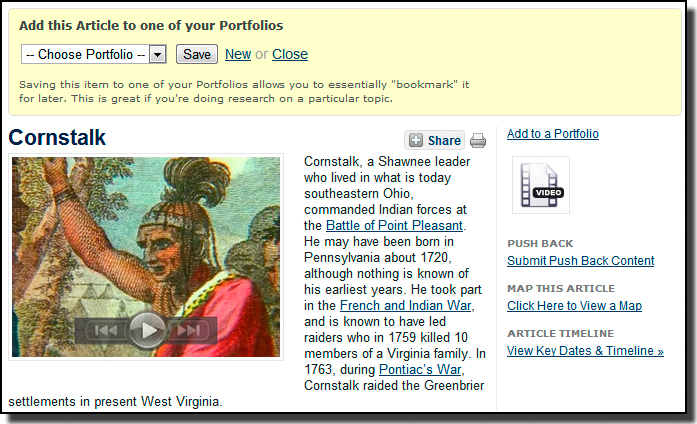 When you click the Add Portfolio button, the new portfolio (In this case, “Cornstalk”) is added. Then just click the Save button to save this article to your Cornstalk portfolio, and you will see “Successfully Added” appear to let you know you’ve done everything right. 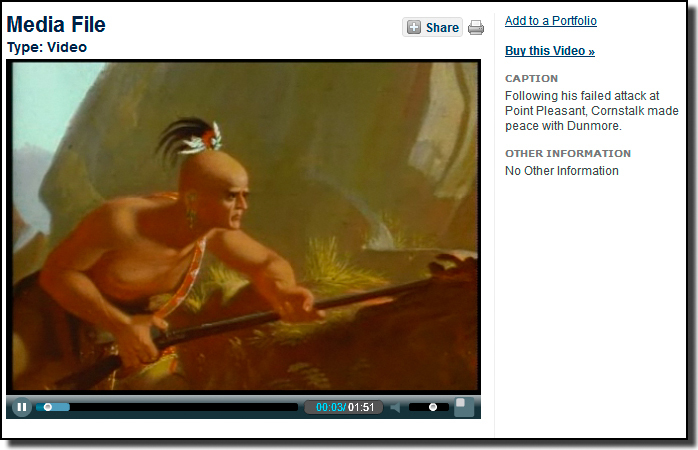 You can add Media Files (video clips, audio clips and still photos, maps and other graphics) to a portfolio. When you see an illustration you like, click on it so that it enlarges in front of the article, then click Full Details, and you will be taken to a screen that has the “Add to a Portfolio” link. 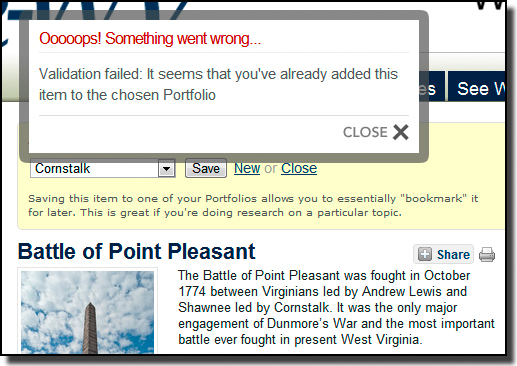 Don’t worry, e-WV won’t let you add something twice to the same portfolio. After you have all the items you are interested in, you can view your portfolio by returning to the My WV tab and clicking on your portfolio. At this point, you can go straight to any article or media file right from this screen. If you have a presentation on a smart board, you can step through it right from here, showing images and videos just by clicking the links to bring them up onscreen. If doing research, you have your assets in one place, ready to access for building your notes. If you have any questions about portfolios in e-WV, contact Mike Keller at e-WV: keller@wvhumanities.org or 304/346-8500.